Katsuhito Ishii’s Smuggler got off to a strange start at Midnight Madness. For one, the print of the film had not arrived by midnight and the rowdy MM audience got some extended burn with the beach ball that is normally bounced around the seats before the show. The film ended up starting at 1am, a full hour late, but was prefaced by an unexpected standup comedy performance from one of the ticket holders. Comedian Bobcat Goldthwait, the director of god bless america, saved the day by entertaining the audience during the delay and even though I had some reservations about his film, I have to admit that the man is funny as hell. It was a pleasure to be present for his impromptu performance. When it was finally time for Ishii to introduce the film, he was bouncing back and forth on the stage in either excitement, nervousness, or both. He was up on stage for a good minute, but I’m not even sure if he said ten words. If the time spent in my seat, waiting for Smuggler to start, could be called weird, then the actual content of the film was downright insane. 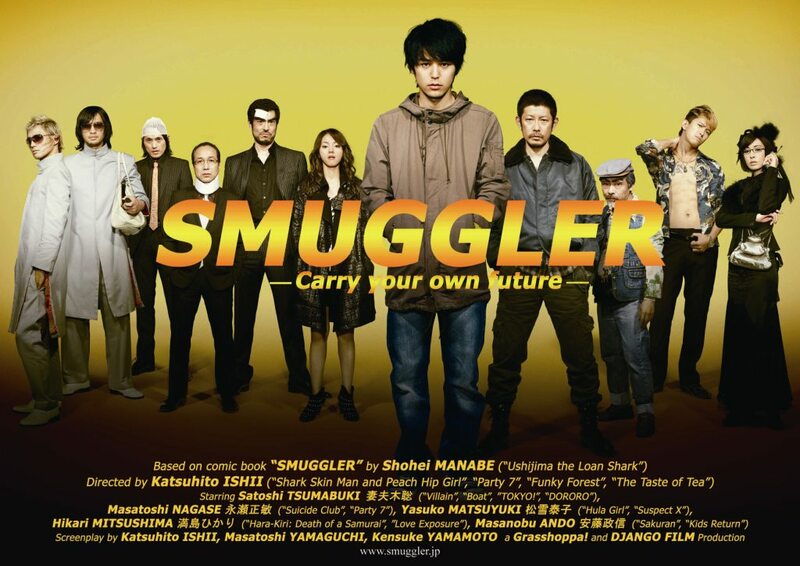 Smuggler is about a young compulsive gambler named Kinuta (Satoshi Tsumabuki) who gets wrongly trapped with an enormous debt from Yakuza members. Kinuta used to be an aspiring actor, but with his new found debt, he is forced to take any job that comes his way. What at first seems like a garbage hauling job, is actually a job transporting mutilated bodies from bloody Yakuza hits. Unfortunately for Kinuta, the nature of his new employment causes him to cross paths with two of the underworld’s deadliest killers, vertebrae (Masanobu Andô) and viscera. To say that the style of Smuggler is unique would be a massive understatement. I have never seen any of Ishii ‘s other films (Shark Skin Man and Peach Hip Girl, The Taste of Tea and Funky Forest: The First Contact, to name a few), but going by their names and the reaction of his fans during the screening, I’m sure that Smuggler was ‘normal’ Ishii. I don’t even know where to begin when it comes to describing the actual content of the film. Very cool slow motion action sequences were combined with inordinate amounts of saliva flying out of the mouths of combatants. Violent torture sequences were carried out by a villain in a ridiculous costume, what looked like a diaper and half a marching band uniform. Finally, the dialogue can feel very serious at times and completely ridiculous at others. All of these factors, and others, make Smuggler an interesting experience, but one in which I felt I was missing out on most of the jokes. I’m not sure if my inability to understand many of the jokes was a result of my limited experience with Ishii films, or if it was a cultural humour that was somewhat lost in translation. Regardless of the reason, I will be going back in Ishii’s filmography to see what I have been missing. Perhaps later I will be able to revisit Smuggler and form some sort of opinion, but until then, I do not have anything too positive or too negative to say about the film. Although, I think that Ishii fans should flock to see Smuggler, as some audience members were laughing hysterically throughout the entire film. TIFF may be over, but luckily for readers I couldn’t keep up with frantically running around to screenings (most at midnight), eating, sleeping and reviewing. As a result there will be some delayed TIFF content over the next few days. Definitely some reviews, the best and worst of the festival (in terms of the films I saw) and some closing thoughts. Check back over the next few days. I wanted to like Douglas Aarniokoski’s The Day, I really did. The stills looked awesome. The action promised to take place almost solely at an abandoned farm house, and regular readers will know that I absolutely LOVE films that use a single location effectively. The film also had a few big names in the cast and an all Canadian crew, what’s not to like? Quite a bit, it turns out. 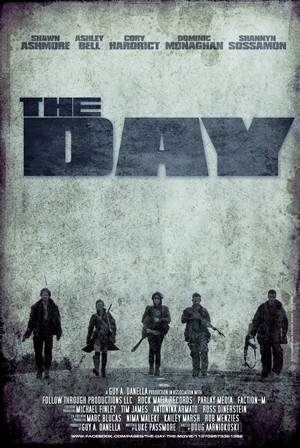 The Day is a generic post-apocalyptic film that holds its cards very close to the chest until the final scenes, at which point it is too little too late. The film tells the story of a group of five survivors (Shawn Ashmore, Ashley Bell, Cory Hardrict, Dominic Monaghan and Shannyn Sossamon) on the run from an unknown enemy. The earth they traverse is a dead world that doesn’t even seem to be populated by small furry animals any longer, let alone other human beings. An illness of one of the survivors forces the group to take refuge in a desolate farm house for the night. Internal conflicts begin to eat at the group from the inside, while a siege of the farmhouse threatens to destroy them from the outside. Unfortunately, this interesting premise turned into an exercise in patience, as I waited for the group of survivors to die and the credits to roll. I feel bad being hard on this film because it was clearly a labour of love for some, director Aarniokoski for example, but was not taken nearly as seriously by others, Shannyn Sossamon and writer Luke Passmore in particular. The acting in The Day was inconsistent throughout the entire film. What I’m sure was supposed to be the lack of hope that comes with a post-apocalyptic world, came across as an absurd calm in the actors that was comical at times. Sossamon’s lines in particular sounded like they were from a screen test. She should have just joined the rest of the cast and crew via Skype during filming, I’m sure it would have been just as effective. However, the real culprit behind the ineffectiveness of The Day was the script. The intriguing set up and ingenious trap at the beginning of the film are completely wasted, as the script completely falls apart when the central characters must meaningfully interact. Relationships and allegiances change at the drop of a dime, profanity is exchanged to simply fill the silence, there are an inordinate number of pointy sticks used as weapons in the film, and the token black guy delivers stereotypical lines. However, these aren’t even the most enraging aspects of the script. Ammo conservation is a constant topic between the characters, after all, where are they going to get more? Then why o’ why do two of the main characters unload their last 4-5 shots into a group of harmless baddies that have gotten stuck in the basement of the farmhouse, when there are plenty of armed baddies still outside? Have they never played Resident Evil before? Conserve your damn ammo or you’re dead! At the same time, maybe they are aware of the importance of ammo, at least if they were it would explain why the main characters never miss a shot with their guns! One maddening scene in particular has a feverish Cory Hardrict seeing in blurry double vision, yet he still manages to pull off what seems like three head-shots in rapid succession. Add to this a cowardly lead villain that is probably afraid of his own shadow, hence his reluctance to attack the heroes himself, and you have a script that should have been lucky to be considered a first draft. Finally, I do actually have some good things to day about The Day. The colour palette and set design of the film are appropriately bleak and manage to absorb the viewer into the deserted world. Also, the action at the finale is quite good and shows what the special effects crew and Aarniokoski are capable of. It is unfortunate that they waited until the end as it may have made the script more tolerable if these accomplished action scenes and effects were scattered throughout the film. If you are a fan of post-apocalyptic films then you may enjoy The Day. In particular fans who vehemently defend post-apocalyptic films, while being impervious to reason and other points of view should love it. If on the other hand you merely dabble in post-apocalyptic films, like myself, then steer clear of this one and go watch Road Warrior or play Fallout 3 to get your fix. Lovely Molly is the continuation of director Eduardo Sánchez’s experiment with first person horror, the initial part of the experiment being The Blair Witch Project. However, the majority of the film is not shot from the first person point of view, unlike Blair Witch. The technique is used sparingly and primarily for time spent alone by the main character in and around a creepy country home. The experiment is hit and miss, as Lovely Molly has enough genuinely scary moments to make it worth a view for horror fans, although the first person moments tend to detract rather than add to the film. I felt lost in the narrative during many of these moments, perhaps it is my fault for not engaging the film enough. The importance of these scenes became apparent near the end of the film, but served only to confuse before that. The film tells the story of Molly (Gretchen Lodge) and her new husband Tim (Johnny Lewis), as they move into Molly’s childhood home to start a life together. It isn’t long before unsettling events, possibly supernatural in origin, begin to happen in the home. Molly finds it harder and harder to spend time alone in the home at night. Truck driver Tim is constantly on the road for days at a time, and Molly’s sister Hannah (Alexandra Holden) tries to help, but can’t hold her hand every step of the way. Add to this, disturbing forgotten memories that begin to surface in Molly’s mind and a struggle with a serious drug abuse problem from the past, and it is apparent that Molly faces a battle for her sanity that may be impossible to win. I don’t know why Sánchez is so enamoured with the first person POV. These scenes were interesting at times during the film, but I thought he did a much better job with the traditional views comprising the rest of the film. Sánchez did a wonderful job building the tension of the suspenseful scenes, waiting just enough time to be exciting, but not so long that the tension was unbearable. Also, ghastly sound effects were used masterfully to indicate a potentially malevolent presence in the house. A deep resonating voice calling to Molly was accompanied by the buzzing of flies made me wish I was elsewhere at that particular time. Another strength of Lovely Molly is the treatment of the real and the imaginary. Out of all the films that I have seen at this year’s festival that have tried to blur the line between fantasy and reality (Intruders and The Moth Diaries), Lovely Molly does the best job of it. I was flip flopping back and forth the entire film as to whether I expected the horror to be a result of mental illness or an actual supernatural haunting. Unfortunately, this also lead to one of my biggest gripes about the film. The end of the film feels rather ambiguous, despite some clear evidence regarding the nature of the horror. This is a legitimate way to end a film, but some of the storyline decisions that lead up to the finale felt kind of clumsy. It feels like many scenes in Lovely Molly were included because they would look cool or be scary as hell, rather than fit in nicely with the ambiguity of the story. It feels like 10-15 minutes of narrative were cut from the film that would have helped to explain some aspects of the storyline and set the scene for a successful ambiguous ending. Why the discovery of the sigil beneath the floorboards? Why the horse head imagery? During the Q & A session Sánchez said that the goal of the ending was ambiguity, although I think this choice of path could have been the result of a somewhat weak script. Finally, the performances turned in by the cast were quite good, with Gretchen Lodge as Molly taking centre stage. Sánchez called Lodge his discovery and I would agree with him. Lodge turns in a masterful performance, transforming from a happy newlywed into a deeply disturbed individual. Lodge should consider some H.P. Lovecraft adaptations if they ever make it onto the big-screen. She also impressed with her bravery standing on stage during the Q & A. Brave, considering her character had a strong dislike for clothing for a large portion of the film. Lovely Molly is a genuinely scary horror film, although it feels a little more like an experiment than an actual story, and the ending feels like a bit of a cop-out. I’m sure there are some people out there that thought the ending was brilliant, and maybe it is, I’m just relaying my feelings after one viewing of the film. Despite it’s flaws, I would recommend Lovely Molly for the scary moments delivered by Sánchez and for Lodge’s performance. It’s not very often that horror films have acting of this quality. I think the horror genre often gets accused of not having anything important or interesting to say about real issues in the real world. I know that some genres are better suited for discussing serious issues, but sometimes a topic comes along that the horror genre has a claim to. Juan Carlos Fresnadillo’s Intruders explores one of the more fundamental aspects of human nature, the birth and promulgation of fear. More specifically, the passing of specific fears from parents to children. I think that parents take too much blame in today’s society for how their children turn out, but a few issues, such as religious indoctrination, anxieties and certain types of fear are without a doubt often passed on from parents to children, and they likely need to take more responsibility for these dubious family heirlooms. This is the topic and the message of Intruders, it is both an urgent and intelligent issue. The film follows two interwoven narratives. One part of the storyline takes place somewhere in Spain, and follows a young boy and his mother as they are terrorized nightly by a supernatural being named ‘Hollow Face’, who would like nothing more than to rip off the young boy’s face and make it his own. The other segment of the film centres on John Farrow (Clive Owen) and his twelve-year-old daughter Mia (Ella Purnell). One day at her grandparents country home, Mia makes quite the discovery as she finds an aged unfinished children’s story in the hollow of an old tree. Unfortunately for Mia, the story is about the legend of Hollow Face, and not long after reading the story, Mia finds herself the victim of Hollow Face’s latest attempt to steal the face of a child. Intruders is not a straight horror film, and really belongs in the psychological horror sub-genre. It is a mature horror film, but unfortunately the scares and horror do not feel as mature as they should have been. That being said, Intruders does a marvelous job of blurring the line between fantasy and reality. Even though I have alluded to the transmission of fears from parent to child, Intruders will keep you guessing about the true nature of Hollow Face until the final scene. The acting is solid all around, with Clive Owen doing a particularly good job, although I’m sure many viewers already expect this of him. 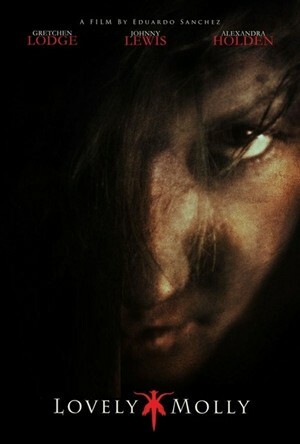 Hollow Face looks quite creepy at times and rather mundane at others, as he takes different forms throughout the film. I can’t help but feel that his most successful appearance was his introduction, climbing scaffolding at night and looking reminiscent of ‘Death’ from Peter Jackson’s The Frighteners. However, some encounters with Hollow Face could have been more frightening. Many times the film is too dark to see what is going on and unfortunately this may take some viewers out of the story, as they try to figure out what is happening onscreen. In the end, the true strength of Intruders is that it is an intelligent horror film. The film makers and distributors may have some important decisions to make as they decide how to market a smart adult horror that is a little short on the actual horror. The next time someone says that horror films are brainless, turn them onto Intruders, although those looking for something horrifying may have to look elsewhere.